Three-phase distribution systems often serve single-phase loads. An unbalance in impedance or load distribution can contribute to unbalance across all three of the phases, which in turn can create excessive current flow in one or more phases that then increases operating temperatures. The increasing operating temperature of the conductors and motor windings can lead to insulation breakdown and potential motor failure, particularly if the phase current exceeds the motor’s FLA (Full Load Amperage) rating. Potential faults may be in the cabling to the motor, the terminations at the motor, and potentially the windings themselves. This unbalance can lead to stresses in each of the phase circuits in a three-phase power system. At the simplest level, all three phases of voltage should always have the same magnitude. 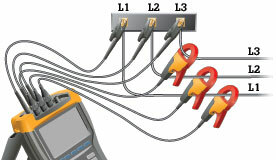 A handheld test instrument such as the Fluke 435-II Three-Phase Power Quality Analyzer can easily check for unbalance data points – voltage (numeric and waveforms), amperage and Hertz – in all three legs. The 435-II is ideal to use in troubleshooting and before and after installing new equipment. Included software also easily captures data, which then can be transferred to a computer. Download "How to troubleshoot motors and drives, starting at the inputs" to find out how to make sure troubled motors are getting the high quality power they need and that it isn’t affecting power quality upstream.